Difficult patient interactions are often the biggest stressors for healthcare professionals, yet the responsibility of many clinical jobs makes these encounters unavoidable. Without training and skills, many professionals either surrender to the aggressor or find it difficult to communicate their point of view for fear of escalating conflict. 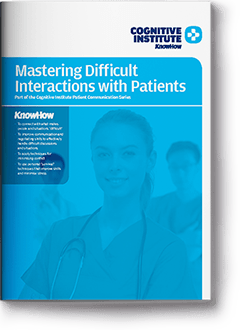 Mastering Difficult Interactions with Patients is a practical skills development workshop designed to give healthcare professionals competence in effectively handling difficult patient interactions. This workshop explores the causes of difficult interactions and the specific challenges faced by clinicians. It teaches how to look past words and emotion to understand patients’ motivations and meaning. Difficult interactions will never be totally stress-free, and the workshop examines ‘survival’ techniques to reduce stress and ensure ongoing improvement. Workshop with short lectures, reflective exercises, small group facilitated discussions, group activities and rehearsal of skills. Brief didactic presentations will provide the focus for small group sessions in which participants are able to share experience and pool knowledge, enabling critical comparison of their skills with their peers and peer learning. Video case studies are used to enable participants to analyse and reflect upon their own skills. The format has been carefully structured to enable a mix of lectures, discussion, critical reflection and evaluation. Participants will be provided with a certificate on request. 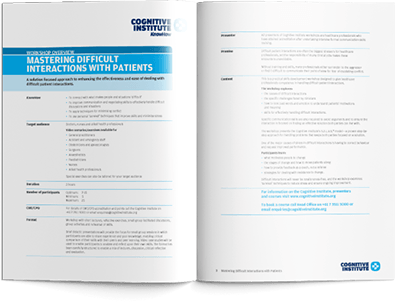 The Mastering Difficult Interactions with Patients workshop is ideal for doctors, nurses and allied health professionals. use personal ‘survival’ techniques that improve skills and minimise stress. Using Cognitive Institute’s S.O.L.V.E.© model; participants will learn a proven step-by-step approach for handling problems that keeps both parties focused on a solution. A solution focused approach to enhancing the effectiveness and ease of dealing with difficult patient interactions.